David French Music - Humes & Berg Trombone Velvetone Mute 8"
Instrument Supplies / Mutes / Trombone Mutes / Humes & Berg Trombone Velvetone Mute 8"
Humes & Berg Trombone Velvetone Mute 8"
The Humes & Berg Stonelined Trombone Mute Series has been a favorite of players and directors since 1935. 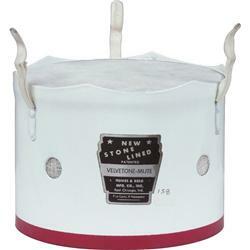 The Stonelined Velvetone Mutes create a big, full and open sound while taking off the hard edge of an open brass sound. Great for blending in with other instrumental sections.